Asteroids come in a range of sizes, from hundreds of kilometers in diameter down to a meter wide and smaller. Determining just how many asteroids there are is a challenge, because the smaller an asteroid’s size, the more difficult it is to observe. Additionally, smaller asteroids are far more numerous than larger ones. The size distribution of asteroids roughly follows a power law distribution. For every 1 kilometer asteroid, there might be a hundred 100-meter ones, ten thousand 10-meter ones, and a million 1-meter ones. Of course this relationship isn’t exact, and variations in this distribution can significantly change the numbers, particularly for smaller asteroids. To really get a handle on the size distribution of asteroids you need to make a large survey of mid to small-sized asteroids. For smaller asteroids, the only way to efficiently determine their size is to estimate it from their brightness. The idea is that larger asteroids reflect more light, therefore would appear brighter. The problem with this trick is that some asteroids reflect much of sunlight that strikes it (have a high albedo) while others don’t reflect much light at all (low albedo). If you imagine looking at a snowball versus a charcoal briquette, you can imagine the difference. Of course there’s also every range in between as well. The brightness of an asteroid depends on its albedo and its size. 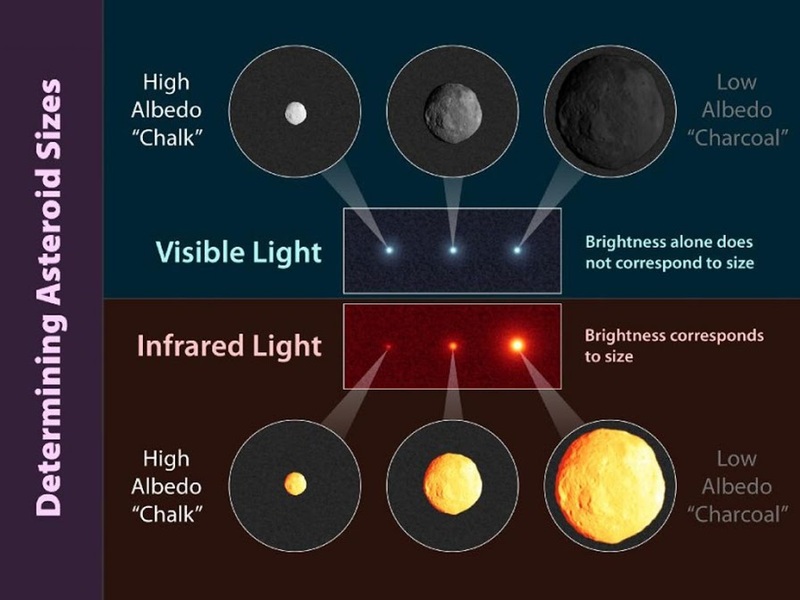 So a small, high albedo asteroid can be as bright as a large, low albedo one. So you do you determine their size by brightness, if it also depends on albedo? You make observations in the infrared instead of visible. Asteroids don’t reflect all the sunlight that strikes them. Some of that light is absorbed, which warms the asteroid a bit. The asteroid radiates this heat as infrared light. Just how much it radiates depends on its temperature a bit, but depends on its size even more. A larger asteroid has more surface area, and therefore gives off more infrared light. 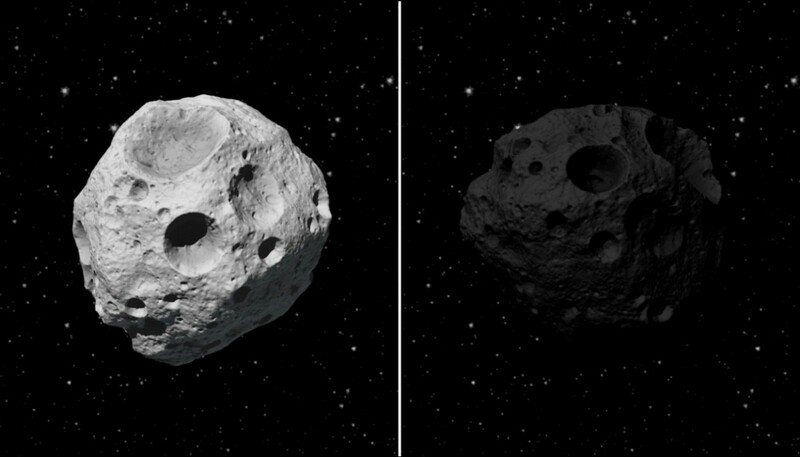 So in the infrared, the brighter asteroids are larger, and the dimmer asteroids are smaller. You can see this effect in the image below. Given that our atmosphere absorbs much of the infrared light, as I discussed yesterday, an survey of asteroids really needs to be done from space. Sending a satellite up just to survey asteroids is cost prohibitive, but fortunately satellite data can be used for multiple purposes. In 2009, NASA launched the Wide-field Infrared Survey Explorer (WISE), with a mission to make a complete infrared survey of the sky. Since it observes the sky in infrared, it can see small dim stars, galaxy clusters, black holes, and a range of other interesting things. It also allows us to search the entire sky for smaller asteroids. What we found was that there are actually less small asteroids than we originally thought. From earlier observations of larger asteroids it was estimated that there were about 35,000 mid-sized asteroids (100 meters – 1 kilometer in size) in our solar system. What we found was there are less than 20,000. So the asteroid belt is considerably less crowded than we had thought. Of course we still don’t know that much about the number even smaller asteroids. We can use the power law model to estimate their numbers, but more data is needed to be sure. Some of that information could come from NASA’s capture of a 25-meter asteroid, if the rumors are true. But that’s a whole other story.